Whether you're planning a new garage, remodeling an old space, or want to recapture an area grown wild with kids' bikes and cardboard boxes, custom garage storage solutions help you remove clutter and create a useful space. Combining hooks, hangers, custom shelves, and cabinets lets you find room for all the necessities without taking up floor space meant for parked cars. Hooks offer storage and display solutions for tools, small parts, garden accessories, and outdoor toys. Combine hooks with pegboard or slat walls, which install on garage walls with minimal tools or work. Most boards do require a drill for installation, and many include hardware for mounting. Integrated systems reduce installation work by making use of tongue-and-groove designs. After just a few minutes of work, you'll have hanging storage options that take up little room in your garage. Use a variety of hook sizes and shapes to keep items visible and within reach, so you always know what you have on hand. 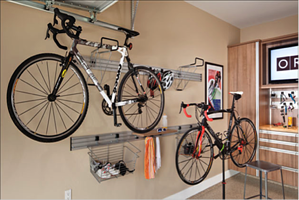 Ceiling-mounted hanger systems let you store larger items in the garage without sacrificing floor space. Many homeowners hang bikes and sports equipment, such as canoes or fishing poles, from the ceiling. Toddler ride-alongs, pool toys, foldable lawn furniture, and some barbeque grills can also be stored in above-head locations. Quality and instruction compliance are essential when purchasing and installing ceiling-mounted storage systems. Some hanging systems can accommodate hefty weight limits, but safety should always come before organization and convenience when making storage decisions. Never rig an installation, use professional parts, and don't overload hangers. Install custom shelving for safe, convenient garage storage that meets the specific needs of your family. Custom shelves often deliver functions not found in prebuilt products, including shelves that slide out for easier access to items or units that integrate with separately purchased slatboard or cabinet solutions. When installing custom shelves, select products with interchangeable parts so you can change the height or size of shelving at a later date. The best garage storage solution is one that evolves with your family. Incorporating garage cabinets into your space provides an opportunity for the cleanest possible garage. Cabinets keep items enclosed, protecting them from dust and debris, but they also deliver a streamlined look against walls. Select floor-to-ceiling cabinets with interior drawers, shelves, or closet-type space for optimal storage. Cabinets with countertops let you use your garage as a work area; mount tool pegboards above counters for utmost convenience. 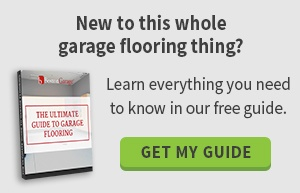 Custom garage storage solutions let you optimize one of the most useful spaces in your home. Do away with stacks of leaning boxes or shelves full of dusty bins, and bring convenience and organization to your garage.